Rosa Nobile’s top notes are impossibly pretty. The first spritz unleashes a delicate and tender haze of pale pink rose water (it’s all very crisp and fresh up top) that is accented by the hissy and bright tones of lemon. There’s a strong sense of greenery too, that makes one feel as if their nose is being firmly pressed into dense shrubbery, littered with the big and bulbous heads of blush coloured roses. Far from being ‘one note’, this litany of rose-facets present a multi-dimensional feel that showcase the complex nature of the flower in an effortless manner. The nose is never overpowered or crowded with ‘noise’, each facet simply plays out quietly and slowly on the skin. Rose dominate in the heart, as one would expect however, the mood shifts from purely rose to a dance of fresh flower petals, where the sharpness of peony and the sweetness of violet temper lady rose into something soft and gentle. As the fragrance moves slowly into the base the more astringent qualities become stronger with the earthiness of vetiver meeting the angular softness of cedar wood, to give the impression of fallen rose buds amongst the earth. All the way through, Rosa Nobile is stunning. I recently took Rosa Nobile away to Tokyo with me for my honeymoon and I saved it for one of the very last days when we visited the Meiji shrine. Amongst the immaculate trees and wood columns of this sanctuary away from the hustle and bustle of the world’s most lively city, Rosa Nobile felt completely at home. Standing there in this completely tranquil place with the soft plumes of pink roses emanating from my skin, I felt wholly and completely at peace. Rosa Nobile is simply gorgeous, in the sense that it is full of beauty and simplicity. It doesn’t try to be an overtly complex, or attention-seeking rose, instead it appears without fuss or fanfare, as a simple ode to the pink rose, all of it, from the stem to the head. Rosa Nobile also displays a light and fresh take on rose that is remarkably diffusive, meaning that it has presence but its sillage is definitely on the more dainty side of things. This is a beautiful and photorealistic rose that simply is an utter joy to wear – I highly recommend it. 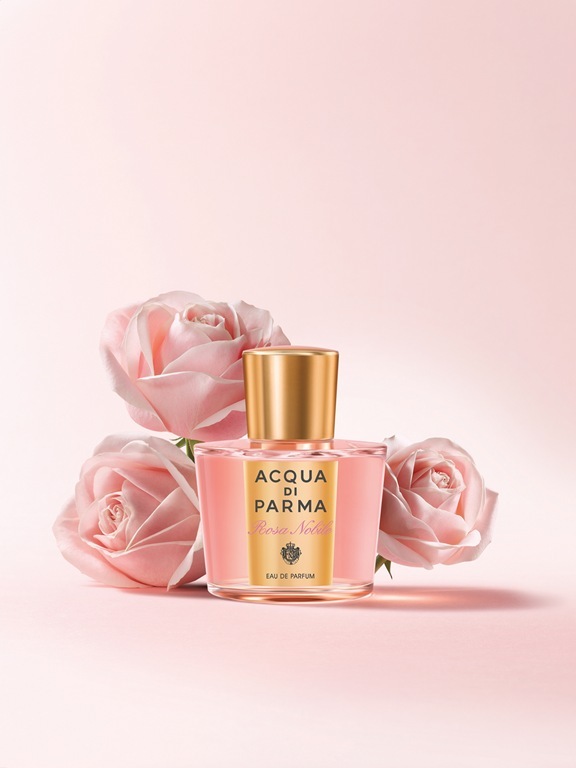 Acqua di Parma’s Rosa Nobile is available in 50ml (£70) and 100ml (£98) Eau de Parfum. A matching Body Cream (£47/150g) is also available. 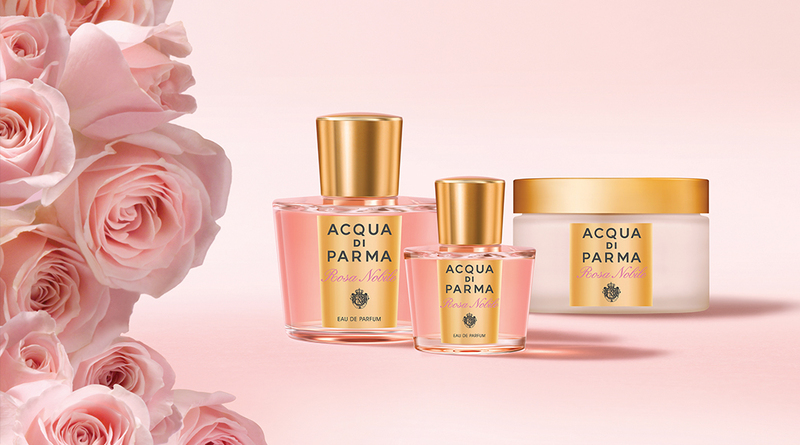 Sample, images and quotes via Acqua di Parma. Notes via Basenotes. Posted in Acqua di Parma, Feminine, Floral, Perfume Reviews, Rose and tagged Acqua di Parma, Floral, Fragrance, Perfume, Perfume Review, Rosa Nobile, Rose. Bookmark the permalink. Hallo Thomas!Great review once again!I have not smelled this as yet,but I cannot wait for it to hit our local shelves soon!Love the brand!And can I just add:I think Acqua di Parma’s packaging is absolutely exquisite,from the bottles to the labels and boxes.It doesn’t scream luxury or excess,it’s just perfect. Hi Thomas, when I bought this in September, there were hardly any reviews of this fragrance. But when I smelled this in John Lewis the first time I was smitten. This is like putting your nose inside a nice smelly rose. It also avoids pairing it with tea or other dark notes. Though sweet, it is more rose sweetness than sugary vanillic sweetness. Absolutely georgeous. Hi Mahesh. I agree, it’s a sweet rose but in a dewy way, rather than a sugary way. thank you for writing this lovely review. The scent is so beautiful. Only: it does not last on my skin. Is it because fo the rose? Lady Vengeance lasts perfectly (also a rose-scent). The short lasting time is the reason why I gave this lovely perfume a no-go. Until now.